Pumpkins serve as more than just a creative prop for Hallowe’en – they are also hotbeds of goodness and well worth incorporating into your diet as the days get chillier. Rich in beta-carotene and a good source of vitamin A, this immune-boosting super-vegetable can help maintain healthy skin, teeth, bones, as well as lowering blood pressure. 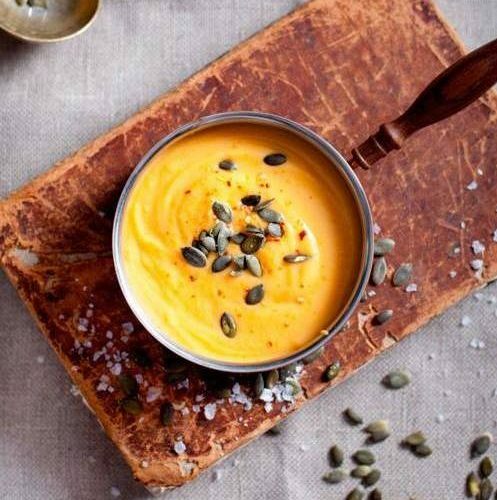 Pumpkins also promote the production of serotonin – that feel-good chemical that helps us to relax and unwind, making this roasted pumpkin soup recipe perfect for colder evenings when a bowl of soup is just what you need! Serve with a swirl of crème fraîche, sprinkle of fresh thyme leaves and roasted pumpkin seeds. This soup is also great for batch cooking and freezing, or freezing in ice cube trays for babies. I love serving it up in a hollowed out pumpkin for a bit of extra wow factor.